Penny and Bill learn how to recognize coins, a little about the history of money, why coins and bills are starting to look different, and much more. They learn strategies for sorting coins and cash and use “skip counting” to find out exactly how much money they have. After lots of counting money, Penny and Bill learn how to make change by pretending to buy funny items at a garage sale. You’ll have time to practice counting money and making change right along with them before you hear the answers. Finally, at the big concert that evening, guess who’s invited to join Penny, Bill on the front row? 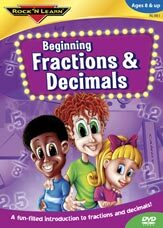 Cool music, colorful animation, and lots of humor—that’s our secret formula for getting kids excited and motivated to learn about fractions and decimals. Kid-appealing songs and rhymes help students of all ages learn new terms and remember the rules about congruent parts, equivalent fractions, proper and improper fractions, mixed numerals, decimals, and more.